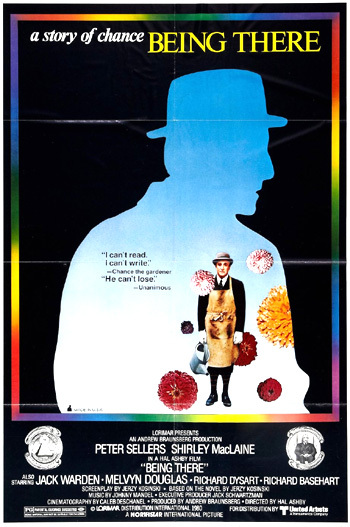 Being There (1979), subtitled "a story of chance," is a provocative black comedy -- a wonderful tale that satirizes politics, celebrity, media-obsession and television. The subtle film's slogan proclaimed: "Getting there is half the fun. Being there is all of it." The film was directed by director Hal Ashby (already known for Harold and Maude (1971), The Last Detail (1973), Shampoo (1975), Bound for Glory (1976), and the acclaimed Vietnam war film Coming Home (1978)). The politically-satirical, overly-long film about mistaken identity and the television age was adapted from a 1971 novel by Jerzy Kosinski, with Sellers in a chameleon-like role in his second-to-last film. His role is a forerunner to the mentally-challenged Tom Hanks character in Forrest Gump (1994). The film had two Academy Awards nominations, including Best Actor for Sellers (his second and last unsuccessful bid - he lost to Dustin Hoffman in Kramer vs. Kramer (1979)) for his superb understated performance, and a Best Supporting Actor Oscar for Melvyn Douglas (his third and last career nomination and second Best Supporting Actor win that defeated Robert Duvall's nomination for Apocalypse Now (1979), among others). It is a placid fable about Chance (Peter Sellers), a reclusive, illiterate, passive and simple-minded gardener who is well-groomed, fed on schedule, and dressed in custom-tailored suits, has lived his whole sheltered life on the walled-in estate of an eccentric millionaire named Jennings (his father?). His only knowledge of the "real" outside world, an encroaching inner-city ghetto area, is through watching television. His meals have always been prepared by the estate's black cook Louise (Ruth Attaway). When Chance's benefactor dies, he is evicted by the estate's lawyers and wanders aimlessly and helplessly into the streets of Washington, D. C. As he emerges into the outside world, a version of Also Sprach Zarathustra is heard on the soundtrack. He is confronted by a young urban gang, and threatens to 'turn them off' with a TV remote control channel-changer. Later in a freak accident, he is struck by a limousine owned by Eve Rand (Shirley MacLaine) and bruises his legs. She takes him to her dying, patriarchal, industrialist husband Benjamin's (Melvyn Douglas) home for treatment from her personal physician Dr. Allenby (Richard Dysart) and recuperation. During the trip, he identifies himself as "Chance...the gardener," which is incorrectly interpreted to be his full name - Chauncey Gardiner. Chance's empty-headed pronouncements and generalizations, delivered dead-pan, are taken to be profoundly intelligent, metaphorically deep, and wisely insightful. He becomes wealthy, is treated as a famous celebrity in the media, and becomes a political advisor for the rich and powerful, including President 'Bobby' (Jack Warden). His new-found popularity leads to talk-show appearances, insider parties, book publisher advances, and the potential to become a presidential candidate. First comes spring and summer, but then we have fall and winter. And then we get spring and summer again. On looking out a car window: "This is just like television, only you can see much further." On planting seeds: "Spring is the time for planting." On economics (actually on gardening): "In a garden, growth has its season...as long as the roots are not severed, all is well, and all will be well in the garden." On watching TV (his most famous line, misinterpreted by Eve as an invitation to sexually stimulate herself while he watches her): "I like to watch (TV)." On death: "I've seen this before. It happens to old people." The last line of the film is a quote from the late Mr. Rand, read at his funeral: "Life is a state of mind." The final scene of his walking on water across a lake gives the film a fanciful element, and leaves the viewer debating, wondering about, and struggling to interpret the fable-like story.